Farmstead Sheep Milk Cheeses from Green Dirt Farm in Missouri! We have so many phenomenal new American Artisanal cheeses trickling into to the Ciao House, that it makes my heart go pitter patter when I walk into the cheese cave. It is important to note that many of these cheeses are shipped to us in in small batches to ensure freshness, and are made seasonally, so we’ll do our best to keep them in stock especially if you let us know that you are featuring them on your menu. 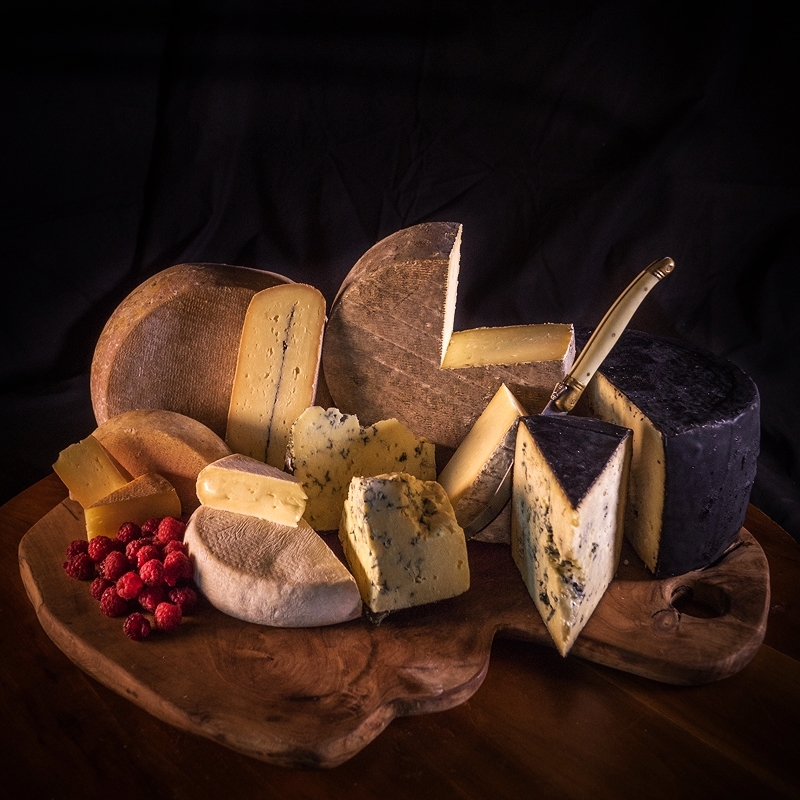 But as with all hand-made products there will be some factors beyond our control (milking seasons, the weather, uncooperative microbes…) These are the cheeses we love, and we’ll rotate through them as they become available to us. Shoot me an email if you would like to be signed up to receive our weekly cheese stock and preorder list so that you can see what’s ripening in the cave. 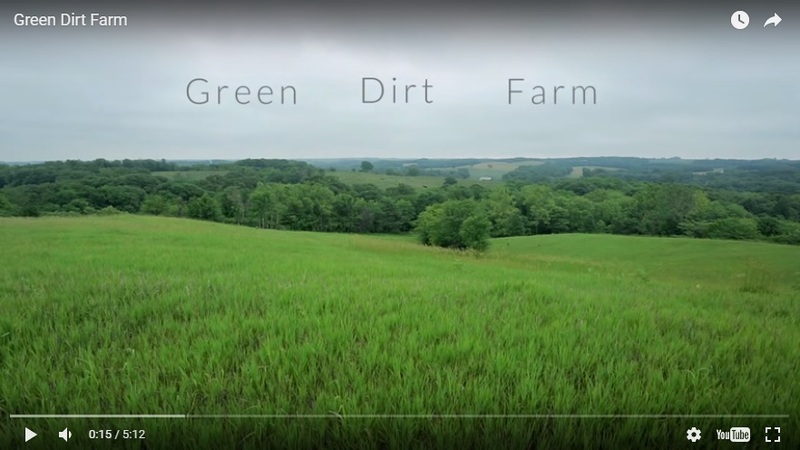 The story of Green Dirt Farm begins with husband and wife Sarah Hoffman and John Spertus, two medical school graduates working in San Francisco. Sarah grew up living on a series of small farms (her father: a Naval Officer, preferred living in the country as opposed to life on the military base), meanwhile John was a city boy from LA. It had always been Sarah’s dream to raise her family on a small organic farm, so when the time came to start a family, they searched for land close to an urban center where John could continue to practice medicine. Small-town Weston, Missouri was a short commute from Kansas City, and in 1996 they bought a 25 acre parcel of land where they built their home. With one small caveat, the soil was highly erodible, and not a fit for growing the organic crops that Sarah had originally envisioned. After researching the soil type, they learned that it was best for growing prairie grasses. And the best natural lawnmowers are… sheep! In 2002 they purchased a dozen Katahdin sheep, and a dozen Gulf Coast Sheep, which formed the base of today’s mixed herd of 200 milking ewes. As it turns out, Sarah’s background in chemistry was a perfect fit for cheesemaking, and after traveling to France and attending workshops around the country, she began to hone her craft. 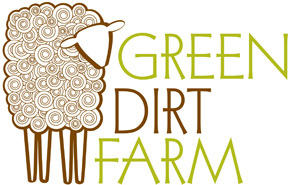 By 2012 Green Dirt Farm was making 1,200 pounds of sheep-milk cheese. The key to Green Dirt Farm’s success is in the name, they believe that “raising [their] sheep on carefully tended pastures not only produces happy sheep and high-quality, flavorful milk; it also prevents soil erosion and helps to build top soil.” Their sheep are kept on a pastured diet of varied grasses, which leads to exceptional milk quality, and in turn, phenomenal tasty cheeses that carry all of the health benefits of pastured dairy products. In addition, Green Dirt Farm is Animal Welfare Approved (AWA) which means that they raise their animals humanely, outdoors on pasture, and enable them to behave naturally and socialize freely. Healthy soil, tasty grasses, happy sheep, and a team of super talented cheesemakers, all play a role in the gorgeous cheeses we just started bringing in from Green Dirt Farm. 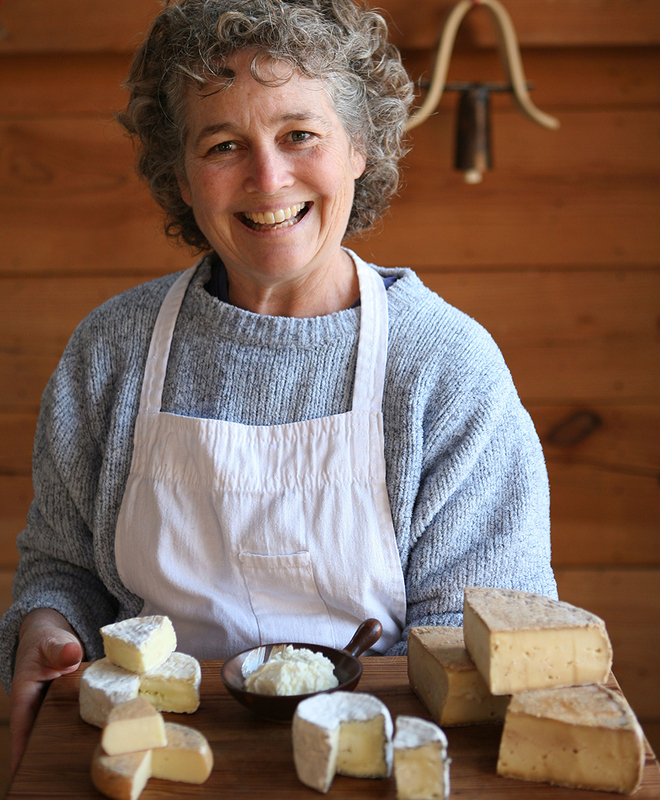 It’s no wonder that Green Dirt Farm brought home nine awards from the American Cheese Society Conference last month! Dirt lover is a bloomy rind cheese with a light coating of vegetable ash. Applying ash to the rind of cheeses is an old-world cheese making technique that helps to neutralize the pH of the rind, encouraging the desired rind formation. The dark line from the ash makes Dirt Lover a striking addition to a cheese plate. Dirt lover tastes buttery, lemony, and mushroomy, and becomes earthy and beefy with age. It smells of wet dirt, like working in the garden. 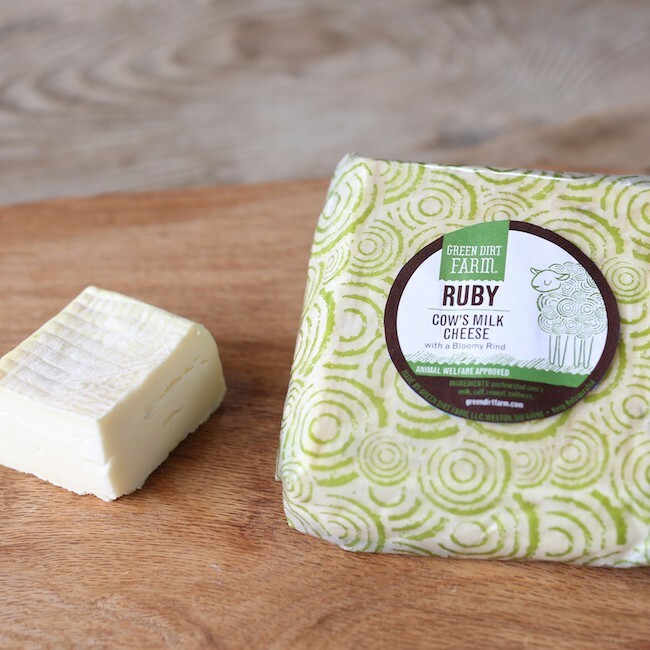 Ruby is a Stracchino-style blended milk cheese, very loosely inspired by Robiola Due Latte. This is the first cheese we have made using cow’s milk at GDF. 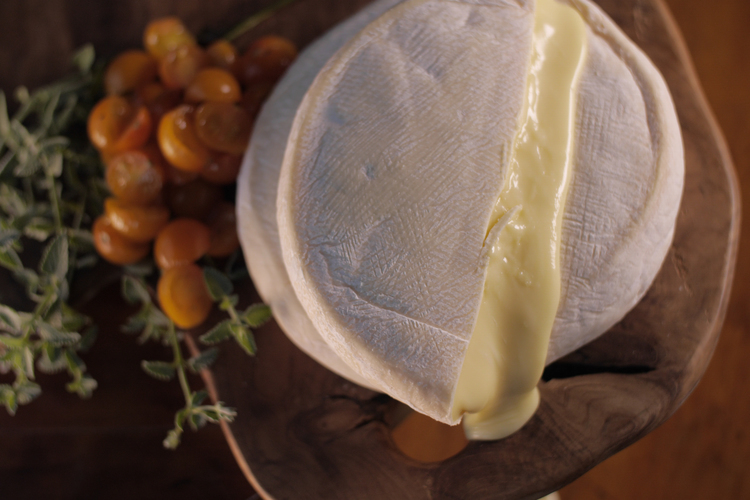 The cheese is washed during the first two weeks of aging, which adds a faint rosy hue beneath the powdery white rind that grows in after. This cheese is buttery and floral with grassy notes. It has a pleasantly tangy, almost yogurt-like flavor when young and becomes fruitier with age. The paste is creamy and pliable with a satisfying texture similar to soft bread dough. Drink with an oaky Chardonnay, mild creamy beers. Serve with spicy arugula salad or a variety of charcuterie. Due to the subtlety of this cheese, it lends itself beautifully to cooking. It will enhance and compliment almost anything. A Green Dirt favorite is to use Ruby on a flat bread pizza with pesto, caramelized onions and walnuts. New Award Winning Cheeses! Raw, Farmstead cheeses from Sequatchie Cove in Tennessee! We just got back from this year’s American Cheese Society Conference (or Cheese Prom, as we like to call it) which was hosted in Des Moines, Iowa. Every year hundreds of cheesemongers, makers, distributors and “enthusiasts” get together to celebrate American cheeses, geek-out, mingle, and taste the increasingly vaste array of American Artisan cheeses. The conference culminates with the awards ceremony, where thousands of cheeses are judged and scored for aesthetics and taste, and then stacked up against each other in super technical categories like “Cheddars Wrapped in Cloth and Linen – Aged over 12 Months, All Milks” and “Washed Rind Cheeses Aged More than 60 Days – Up to 42% Moisture – Goat’s.” It is our version of the Oscars, but smellier. We have so many phenomenal new American Artisanal cheeses trickling into to the Ciao House, that it makes my heart go pitter patter when I walk into the cheese cave. It is important to note that many of these cheeses are shipped to us in in small batches to ensure freshness, and are made seasonally, so we’ll do our best to keep them in stock especially if you let us know that you are featuring them on your menu. But as with all hand-made products there will be some factors beyond our control (milking seasons, the weather, uncooperative microbes…) These are the cheeses we love, and we’ll rotate through them as they become available to us. Shoot me an email if you would like to be signed up to receive our weekly cheese inventory list so that you can see what’s ripening in the cave. 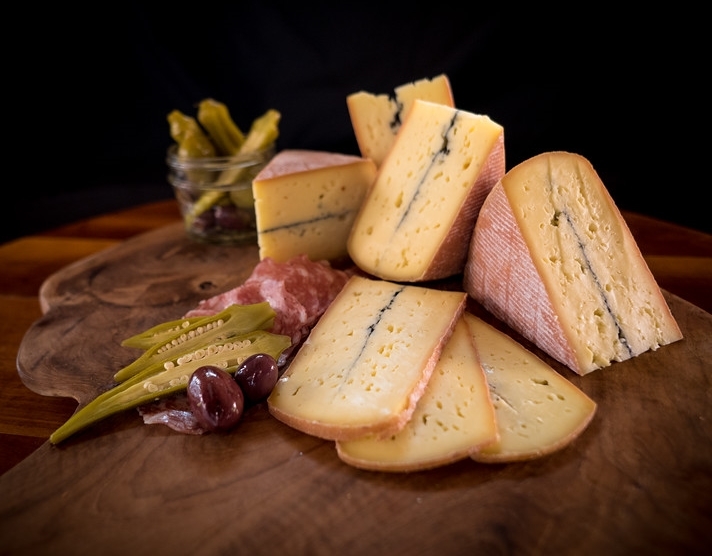 Sequatchie Cove Creamery is our newest cheese producer, in fact, their cheeses arrived at Great Ciao on the same day that they were winning big at the ACS conference. Padgett and Nathan Arnold began working on the farm in 2003, tending to the vegetables before getting involved in animal husbandry, and eventually making cheeses to share with friends. 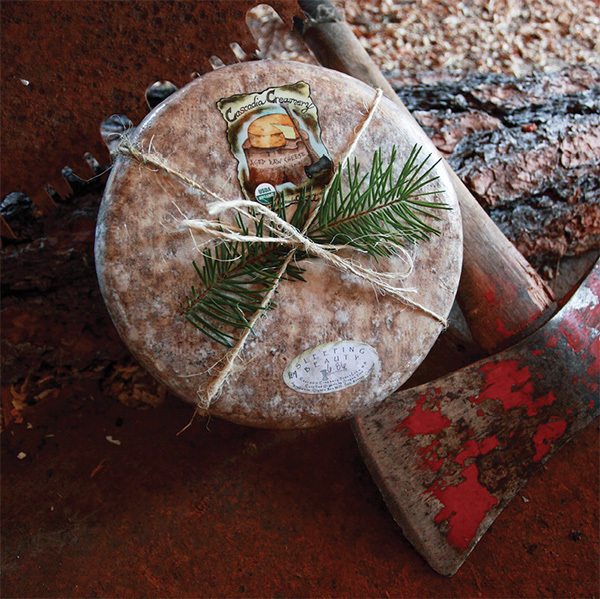 In 2010 they opened Sequatchie Cove Creamery at the farm, and began making traditional French inspired raw milk cheeses from the Savoie region, with a bit of southern flair. I first tried the Shakerag Blue in 2012 when it was just being developed, and instantly fell head over heels for their cheeses. Shakerag blue could be the lovechild of Rogue River Blue and the piquant Spanish blue cheese Valdeon. Like the Rogue river blue, Shakerag is wrapped in leaves (fig) which have been macerated in booze (Chattahoochie Whiskey) before being aged for six months. The resulting cheese is spicy and rich, with an intense fruity/boozy finish. The Dancing Fern is oozy and unctuous, and one of the few Reblochon inspired raw-milk cheeses being made in the U.S. – they literally have to wait until it is 60 days old before it can be sold, and so we get it here with a few weeks of gooey nearly contraband perfection. The final cheese we have from Sequatchie in this round is their Coppinger, a Morbier style washed rind cheese, also made with raw milk, and bisected with a line of vegetable ash through it’s center. Coppinger is buttery in aroma, and velvety in texture, gorgeous on a cheese board, as well as being a fantastic melter. It is hard to say if we are crushing harder on the cheese, it’s producers, or their absolutely gorgeous farm. Whatever the verdict, we are thrilled to add these beautifully crafted cheeses to our American Artisanal Cheese selection. Watch the short documentary below, or read more about Sequatchie’s cheeses. They are here and ready to enjoy (supplies are limited) let us know if you need a taste! 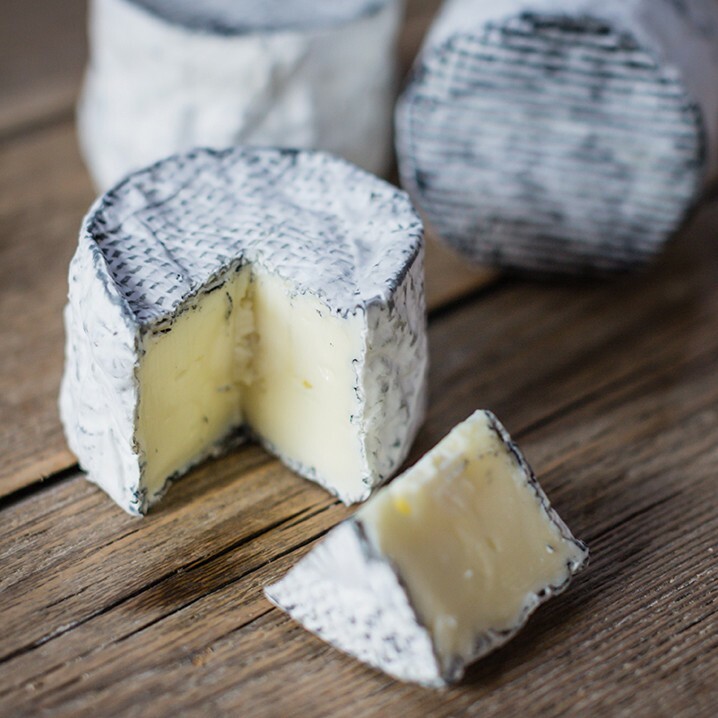 Named for the native ferns that sway and nod at the breezy mouth of a cave in Coppinger Cove where the farm is located, Dancing Fern is inspired by the famous raw milk Reblochon cheese of France. Its soft and supple texture and barnyardy aroma, along with notes of cultured butter, shiitake mushroom, and walnuts make it a stand out on the cheese plate. Pairs nicely with Beaujolais, Trappist ales, marmalades and preserves (in particular grapefruit), and fresh in-season peaches. Works wonderfully in a classic Tartiflette recipe. Shakerag Blue’s colorful name is derived from both the beautiful Shakerag Hollow known for its wildflowers and rich moonshining past, as well as an old Prohibition era method of either alerting moonshiners to approaching revenue agents, or as a way to procure some white lightening of one’s own. 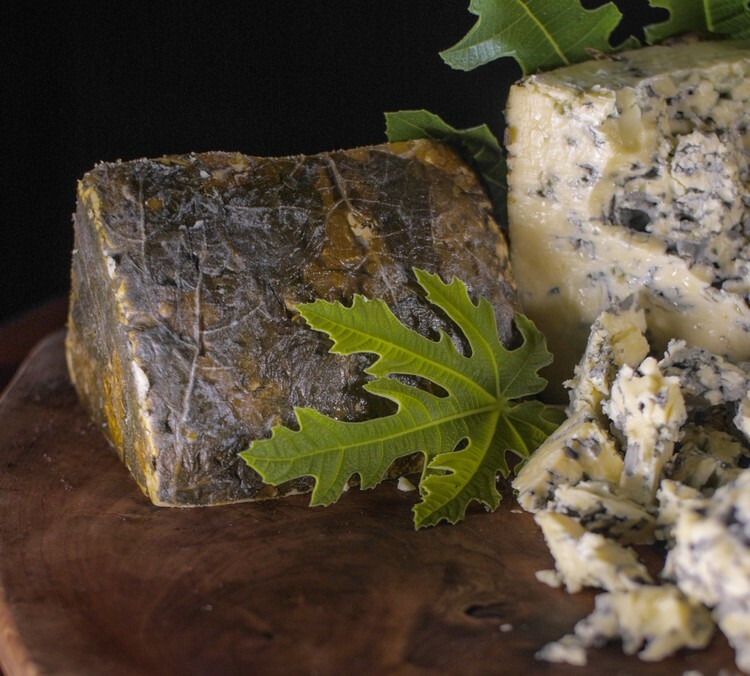 An ode to all things Southern, Shakerag is a crumbly yet dense blue-veined cheese cloaked in local fig leaves which have been soaked in Chattanooga Whiskey, the first legal whiskey being distilled in the city since Prohibition. 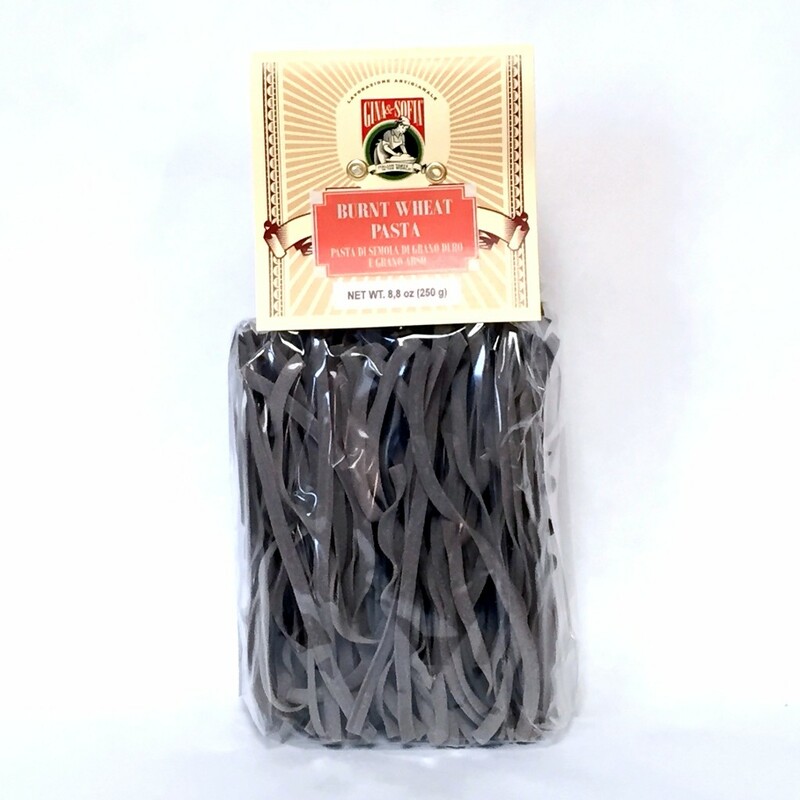 Its salty-sweet and fruity interior is reminiscent of root beer, and lends itself to more complex notes of savory bacon, dark chocolate, and tropical flavors towards the rind. Pairs nicely with Chattanooga Whiskey, barley wine, root beer, dried fruits, and raisin toast. Crumbles well for salads and steaks, and deserves a prime spot on the cheese board. Coppinger Cove sits at the base of the Cumberland Plateau and is the secluded hollow where the farm and creamery call home. A Southern take on the classic French Morbier, Coppinger is a semi-soft washed rind cheese with a striking layer of decorative vegetable ash in its center. The velvety elastic paste is savory with notes of fresh grass and smoked meats, making it ideal for the cheese plate or melted into any dish. Pairs nicely with fruity lighter bodied reds such as Beaujolais Nouveau, malty ales and stouts, pickled vegetables, bacon jam, and charcuterie. Try it melted on a burger or as the ultimate grilled cheese. nce again, we have beautiful new cheeses, made by beautiful people, in a beautiful place; this time hailing from the rural mountains of the Pacific Northwest where unique lava tube formations create the ideal underground aging caves for their handmade cheeses. Cascadia Creamery came to us by way of a local chef’s recommendation. He was so adamant that we taste their cheeses, that he had some small pieces shipped to his restaurant from a cheese shop in Portland for us to try. It is unusual for a upstart cheesemaker to hit it out of the park on their first go-around, but all of the cheeses we tasted from Cascadia Creamery were knockouts. From the Glacier blue that had the perfect dry minerality of a French Fourme d’Ambert, to the sleeping beauty that tasted just like buttered popcorn, all of them were in pristine condition, each one unique from the rest. We had some shipped to Great Ciao post-haste, and have been crushing on their cheeses ever since. A beautiful article was just written about John and Marci Shuman’s creamery in Cheese Connoissour Magazine. Click here If you would like to read more about their operation. It’s here, it’s (FDA) clear, and it needs a good home! 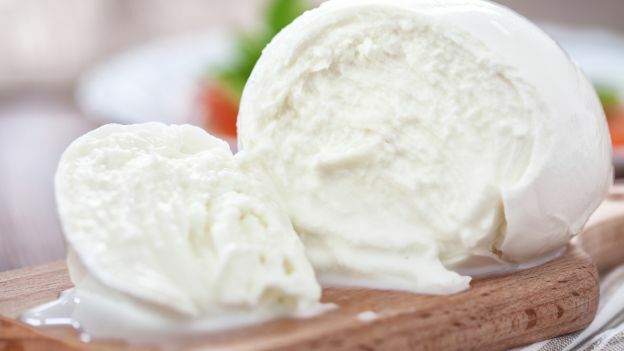 Today we received our first shipment of DOP Ricotta Romana: fluffy clouds of sheep milk curd made from the whey of sheep milk cheese production in Lazio, the region surrounding Rome. 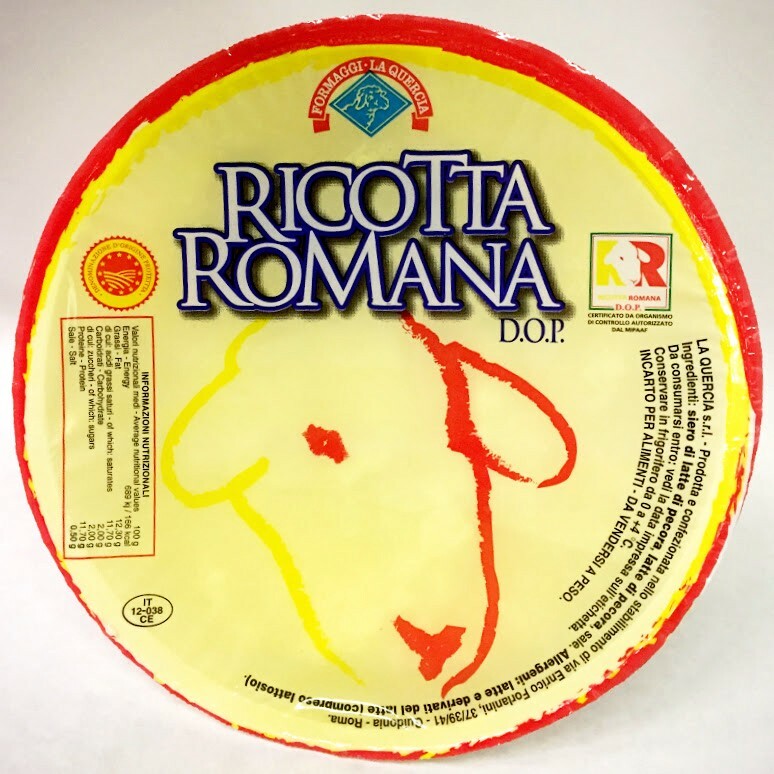 To earn the DOP title, Ricotta Romana must be made using the whey from whole sheep’s milk that has never been frozen, from four specific breeds native to the region, the sheep must be raised on pasture in the farms surrounding the region of Lazio, and no additives are allowed during production. Traditionally ricotta is the ultimate peasant food, made as a byproduct of whey produced during cheese production, the name itself translates to “re-cooked”. Whey is protein and lactose rich, and still contains enough ambient butterfat to glean some ricotta as a nutrient rich food. However, today the majority of Ricotta is made from whole-milk as opposed to whey, for a richer texture and flavor. Ricotta Romana is traditionally made using the leftover whey from Pecorino Romano production, and is cooked in the same vats used to make the cheese. While Ricotta Romana is primarily a whey Ricotta, up to 15% of the total mixture can be obtained from whole sheep milk for better yield and texture. The whey used to make Ricotta Romana is uniquely sweet, and lends a sweet, nutty quality to the final product. After the whey and milk are gently heated, the cheesemakers use perforated ladles to gently scoop out the flakes of ricotta that form on the surface, and allow them to drain in wicker or plastic baskets. Ricotta Romana is sold in 2Kg (4.4lb) baskets, and it’s shelf life is fleeting (read: a week after it gets off the plane.) This ricotta is so spectacular on its own that you almost hate to adulterate it in any way, but you couldn’t go wrong with seasonal berries and some good local honey. We have a few to get you through the weekend if you are looking for something extra special that doesn’t often make it’s way into Minnesota. Give us a call at 612.521.8725 if you are interested. If you are feeling especially scholarly and want to know more about DOP Ricotta Romana, check this out, the article is also full of pretty pictures for rest of us. 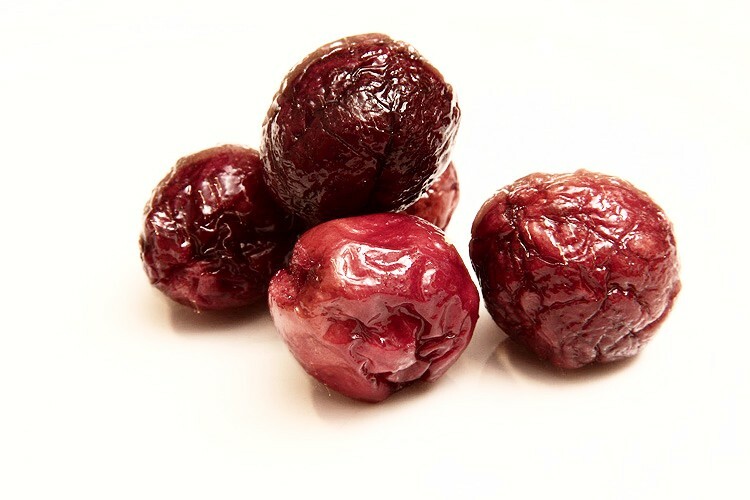 We found a stall highlighting Chilean dried fruits at the Fancy Food show last year, and were immediately drawn to these plump Red Globe grapes, that looked about as close to the fresh version as possible. They explained that they used a special low-heat drying process that preserves the integrity of the fruit, both in size and color, and in flavor and nutritional content. I had to stop myself from eating the entire display. The texture is crispy on the outside, and chewy and yielding on the inside. Because Red Globe grapes are a seeded variety, they do have a few small crunchy seeds that would be difficult to pit, but the drying process renders them crunchy, nutty and completely edible. In flavor, they don’t have any of the mustiness of regular “raisins”, instead they are sugar sweet and juicy with a touch of acidity; just like the real thing, but with a more interesting texture. 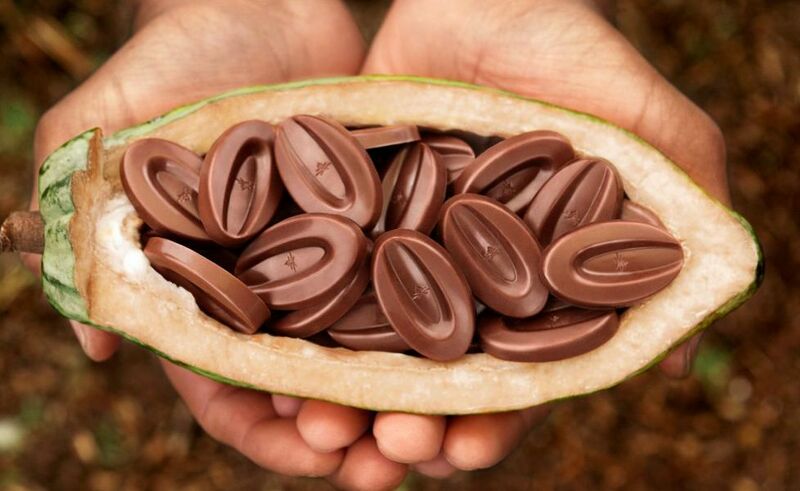 We prefer to snack on raw ingredients out of hand and let you the chefs come up with interesting ways to use them. So far we’ve seen them re-hydrated, used in desserts, and thrown on cheese boards. One of the best parts of the job is listening to the the myriad of creative ways our customers pronounce the name of this dutch stone-ground mustard (thankfully, the label now clarifies that it is pronounced “boat-cheese”). 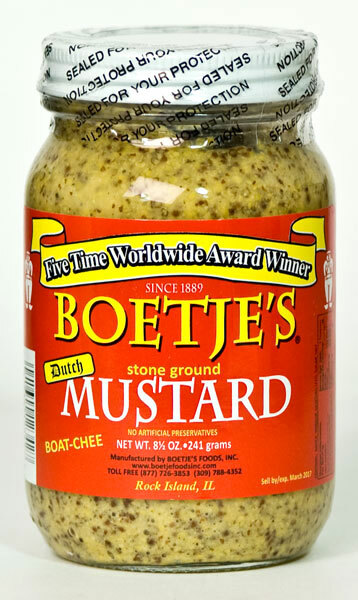 Funny name aside, Boetje’s mustard has been a local chef favorite for years. Made locally-ish in Rock Island, Illinois, this mustard has the kind of horseradish/wasabi intensity that clears out your sinuses, while still having great depth of flavor and texture. I personally love it on a BLT (braunschweiger, lettuce, and tomato) sandwich, but I also have the palate of an eighty-year-old man. Anyways, its always nice to hear when our producers get a little recognition for their hard work and dedication to producing tasty grub. We just heard through the grapevine that back in April, the nice folks at Boetje’s took home the gold medal in the course-grain mustard category, and then went on to become the Grand Champion of the entire competition at the Annual World-Wide Mustard Competitionhosted by the Mustard Museum in Middleton, Wisconsin. This is the first time in the history of the competition that the top grainy mustard has gone on to win this prestigious award. Boetje’s Mustard is sold in one gallon tubs for food-service, as well as in 8.5oz. glass retail jars. There are a few super-obscure products we’ve sourced over the years that have managed to build up a bit of a cult following. When we can’t get them, their absence can make even the most even-keeled chef cry foul play. Unfortunately, these weird little fruits have been held up by U.S. Customs for the last several months, but we are pleased as punch to announce their triumphant return to our warehouse! 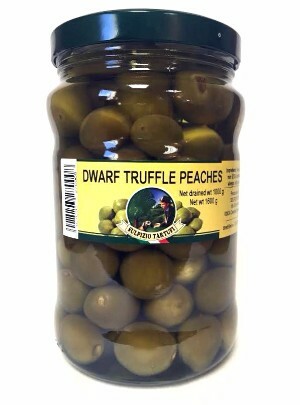 Truffled dwarf peaches have an amazing bright crisp flavor that is both familiar and surprising to your palate. The familiar sweet and sour pickle is bolstered by just enough truffle to tease your senses. The size and texture is familiar; crisp like an olive or cornichon, and the size of a caper berry or Cerignola olive. Because the fruits are picked young they have no pit and are sweet sour rather than salty in flavor. In the fall, before winter arrives the farmers pick the unripe peaches, so they do not go to waste. Then, they pickle them in vinegar to conserve the peaches and consume them like any other pickle. Sulpizio Tartufi added a twist to the product by soaking the peaches in sunflower oil and infusing the oil with the essence of white truffle. These peaches have just enough truffle flavor to let you know that they are a truffled product, but not so much as to over power the dish that you are using it on. They add a pleasant crunch and acidity to any salad, garnish or condiment and at the same time perfume your dish with the pleasant aroma of truffles. You can chop them into a vitello tonnato, slice them into a salad, serve them in an aphrodisiacal dirty martini, or just eat them whole when the chef isn’t watching… you can think of more uses than we can. New At The Ciao House: Burnt Wheat Pasta From The Heel Of The Boot! To most chefs “pasta nero” means pasta died black with cuttlefish or squid ink. In parts of Southern Italy, pasta nero gets it’s name from being made with “farina arso” or literally, “scorched wheat.” Puglia (Apulia) has historically been one of the poorest regions of Italy. According to the local legends, after the peasants had spent the fall harvesting durum semolina wheat, the fields would be burnt to prepare for the next year’s harvests. The wealthy landowners would allow the peasants back on to the field to collect whatever burnt husks of wheat remained, which they would use to prepare this peculiar pasta. Pasta Nero made from scorched wheat has had somewhat of a comeuppance in the last few years, especially as chefs rediscover traditional regional foods, and elevate “la cucina povera.” We carry this Taglietelle from Gina e Sofia, a small producer in the southernmost Salento region of Puglia, their version is malty and toasty with a slightly cinnamon finish. Its hard to go wrong with the burnt pasta and a bit of grassy Sicilian olive oil, Calabrian peppers, and Pecorino Romano, but Great Ciao Jessica also highly recommends simply tossing it in our ridiculously awesome French cultured butter from Rodolphe le Meunier to bring out all of the pasta’s subtle nuances. We can’t argue with that. Hazelnuts and chocolate – as inseparable a duo as PB&J, Milk and Cookies, Han Solo and Chewbacca… Valrhona’s newest release is the latest cause of our warehouse snacking binges; 35% milk chocolate blended with hazelnuts, for a rich milky texture balanced by intense hazelnut flavor. 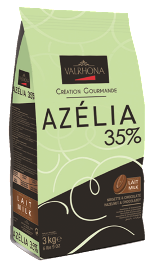 Cases are 3 x 3Kg Bags, Valrhona is sold by the whole case for a discount, or by the individual 3kg bag.